NYSACHO supports, advocates for, and empowers local health departments in their work to promote health and wellness and prevent disease, disability and injury throughout New York State. Ensuring transparent, ethical, and accountable performance. 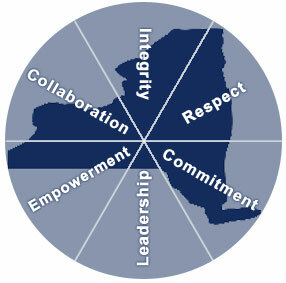 Showing regard for self and others and maintaining the environment of team work, growth, and enhancement. Building passion and shared responsibility to achieve our goals. Developing and exemplifying the courage to set a course and shape the future of public health. Leveraging our knowledge and experience to achieve success. Working together with others to promote excellence in public health through the exchange of ideas, programs and policies. Board of Directors Meet our directors who are dedicated to supporting local health departments and creating healthy, safe communities in New York State. History Organized in 1979, the New York State Association of County Health Officials (NYSACHO) is a membership association representing the 58 local health departments in New York State, each of which has one vote. Staff Meet our staff who are dedicated to supporting local health departments and creating healthy, safe communities in New York State.